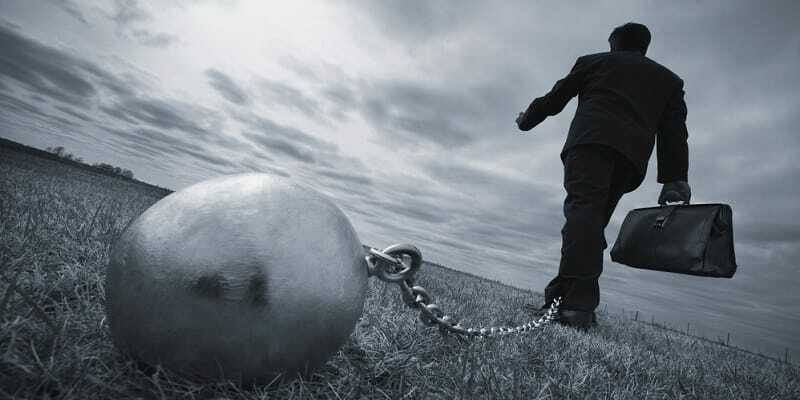 Home » Why is the Fed so hell-bent on enslaving us with debt? Why is the Fed so hell-bent on enslaving us with debt? The Fed would have you believe they’re working in our best interests. Then why are they printing our money into oblivion? The conflict of interest at play may surprise you. Central banks around the world have doubled down on failure. It is insane. The most insane thing is everyone seems to know and agree that all this Quantitative Easing and stimulus has been nothing but an abject failure. Former Federal Reserve Chair Alan Greenspan has made a few highly publicized speeches lately acknowledging this. Mario Draghi knows it’s true; even as he devalues the Euro, he still will never sell gold. Telling. Everyone knows it’s a dead end. But instead of hitting the brakes and changing course, central banks the world over have hit the accelerator. The apologists are working hard to convince people that with just a little more stimulus, it will work this time. Or, they try to put forward that if there had been less stimulus in the past, the economy would be even worse off now. The central banks and apologists simply can’t let go of the false liquidity. They are addicted. Listening to central bankers nowadays is like listening to a self-destructive addict trying to justify deadly choices. They are afraid of the effects of withdrawing stimulus like an addict who can’t bear to go through the tremors of withdrawal. More than the very real threat of inflation, they fear deflation. Even as Americans (and indeed, consumers all over the world) struggle to keep up with higher prices and stagnant employment figures, bankers fear falling prices and stable currency. In our modern monetary and banking system, where economic success is measured through consumption, spending, lending and borrowing, the interests of bankers and consumers are at odds with each other. The average person would prefer not to have to go into debt to meet their basic needs. That debt is an albatross around their neck, sapping away wealth over time. But the central bankers’ whole raison d’etre is to push people into debt. They do this with low interest rates and higher price tags on everything. And then by devaluing the money by printing it into oblivion, they promise that the debt will be easier to pay off in the future. This is incredibly damaging to the consumer. This makes it increasingly difficult to avoid being turned into a debt junkie. Loose monetary policy pushes consumers into an inflationary corner where they left very vulnerable. Central banks are inflating their currencies and manipulating interest rates all in the name of helping their export industries sell their goods at relatively cheaper prices. It also helps governments pay down debt a little easier or (usually) borrow more money at cheaper interest rates. In other words, it helps the major players and the powers-that-be, while it enslaves the average citizen with debt and reduced purchasing power. It is both a war between currency systems and countries and against the average citizens in every country. Worse, it is a war with no winners – only losers. Now Japan has fired a major shot in this global currency war by announcing an extravagant stimulus package for its economy – one that has now been stalled for decades in spite of near continuous stimulus and low interest rates. Banks, bankers and mainstream economists will try to tell you that these loose monetary policies are necessary for a functional economy, that economies must be managed from the top to keep them moving. They will tell you that a central bank is some kind of balancing force to even out the edges of the business cycle. They will tell you that sound money, the gold standard, was even worse than what we see today, that as bad as things are, they were more volatile before fiat Federal Reserve Notes. They’ll claim that deflation is the real boogeyman: We save you from the horrors of falling prices with our economy-soothing inflation. YOU NEED US! Nothing could be further from the truth, of course. No, deflation would not harm the common man, and no, the gold standard did not cause the Great Depression. This is fear mongering to convince the greatest victims of fiat monetary schemes that a threat to the establishment is a threat to everyone. It is not. In fact, all fiat money schemes eventually come to an end for the same reason. Governments and central banks cannot responsibly handle the power of the printing press. As we are seeing around the world today, they universally come to the point of printing their currencies into oblivion. The temptations are just too great and there is nothing strong enough to stop them, short of outright currency failure. A strict gold standard took away that power and gave the people the power of a stable currency and a reliably priced economy. By owning gold, you can harness a piece of that power for yourself and your portfolio. Be prepared for the ongoing currency wars and that deadly race to the bottom. Start by subscribing to our YouTube channel to keep tabs on the latest precious metals news. And if you don’t already have some of your savings in gold, call us now.